Subaru of America is partnering with Best Friends Animal Society to hold an adoption event at the Los Angeles Auto Show. Through a partnership with Best Friends Animal Society's No Kill Los Angeles initiative, the adoption event is the first-of-its-kind event held inside the Los Angeles Convention Center at the Subaru exhibit. Pets are an important part of Subaru owners’ lives, says Todd Lawrence, national manager of auto shows and events, Subaru of America, Inc. In fact 67% of Subaru owners are pet parents, with nearly half of them having at least one dog. Subaru debuted the offsite adoptions at its National Business Conference earlier this year. Auto show attendees are able to interact with adoptable pups from 9 a.m. to 2 p.m. on weekend show dates, which this year were Dec. 1 and 2 and this coming Saturday and Sunday. In addition to being able to take canine friends home, attendees can make rope toys as a donation to the shelter or for their own pet, as well as create custom pet tags using the Subaru Loves Pets engraver. All activities will be complimentary, with donations and proceeds going to Best Friends Animal Society's work in Los Angeles. 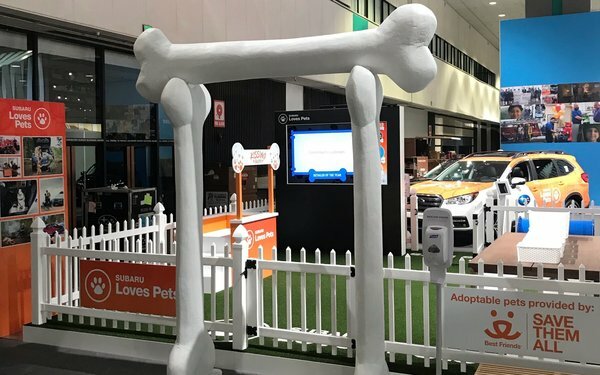 This LA Auto Show adoption event is a part of the Subaru Loves Pets initiative, which is dedicated to helping improve the safety and well-being of animals in communities nationwide. The automaker unveiled its first-ever plug-in hybrid last week during the media preview at the auto show. The Subaru Crosstrek Hybrid will be sold first in California and other states that match California’s zero-emission requirements, starting the end of December. Exclusive to the 2019 Crosstrek Hybrid is a new exterior color, Lagoon Blue Pearl, one of four available hues. Also announced, Subaru is partnering with JadeYoga (yoga mats), Klean Kanteen (water bottles), Rumpl (outdoor blankets), and Topo Designs (outdoor apparel and accessories) to develop products with designs exclusive to Subaru. The new gear is being introduced in conjunction with the launch of the all-new 2019 Forester.